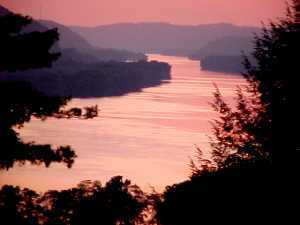 ----- The Ohio River system drains 204,000 square miles within fourteen states. More than 95% of Kentucky is drained by the Ohio, and over 80% of Tennessee, West Virginia, Ohio, and Indiana, 30% of Illinois and Pennsylvania, 20% of Virginia, and 10% of Alabama. Small parts of New York, Maryland, North Carolina, Georgia and Mississippi also drain to the Ohio. It is a mighty river. ----- "How long do we have, weather-wise?" El queried. -----"Well," I paused, while clicking into our laptop for data. "It's mid-October. Probably a month. Maybe longer, if we are willing to put up with some cold," I answered, looking up from the climatologic data we had downloaded from the Internet. -----At the time, we were snuggled into a marina on the Mississippi River, near St. Louis. Dawn was spreading violet-blue through the sky and the dark water of the river was spattered with swirling rings of color, like drops of oil spread by a careless painter on a slate blue palette. -----We had just completed our cruise down the upper reaches of that storied river, the major artery of the heartland of America. Now it was time to consider travel on one of her major tributaries - the Ohio. -----"We have a good heater-stove. We've been comfortable in the mid-20's back on Lake Powell - We can take the cold. Let's figure on at least a month." -----"The main trunk of the Ohio is 981 miles long," I answered, now puzzling over the charts displayed on the computer screen. "We should have enough time to cruise the Ohio, but what about all those tributaries?" The Ohio system looked like the cardiovascular chart I had first marveled over in pre-Med Biology. The aorta branches into arterioles and finally into capillaries. When the sum of the total, even neglecting the capillaries, is added to the main trunk, there are 2,400 miles of navigable water on the Ohio system. -----There are 25,777 miles of navigable waterways in the United States, according to the Corp of Engineers, and they should know - they are responsible for keeping it navigable. Their figure includes inland rivers and lakes, the Intracoastal waterways, coastal deep-draft rivers and channels and harbors. More than 2 billion tons of commerce travel on these waterways. Halcyon is an uncounted bip among those statistics. -----The Ohio is indeed a mighty river. The entire Ohio System is almost 10% of the nation's total navigable waterways. -----"So many miles - so little time," I mused, tracing the meanders of tributaries with the pointer on the computer screen. -----"Let's start from the top," El answered, with her usual optimism. "We can see how time and weather goes and let serendipity govern which tributaries we explore. We'll be doing them from the bottom up, and back again to the main trunk, so we don't have to choose now." -----"Where do we start? That we do need to choose now," I said. We both squinted at the computer charts of the Ohio. It was immediately evident that the Ohio presented another difficult choice. Most rivers begin from a spring or a swamp, high in the mountains, and trickle down hill gathering water from other tributaries as they go. Eventually, the river contains enough water to be navigable by a boat our size and that's the head of navigation for us. The Ohio is different. It begins at the junction of two major rivers - the Allegheny and the Monongahela. They join at The Point in Pittsburgh. Both of its 'mother' streams are themselves navigable for a considerable distance upstream. We could start at the head of navigation on either stream, or put in on one and cruise to the heads of both. Or, like many multiple-choice questions, we could do none of the above. -----"Lets do 'none of the above,'" El suggested. "Both the headwater rivers have many locks and dams. There's too little time to explore those headwaters, if we want to avoid freeze-up. 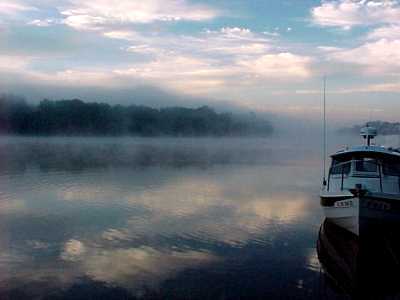 Lets do the Ohio, itself, and return another day to poke around the headwaters." -----"OK," I mused, staring at the downloads in our laptop computer. 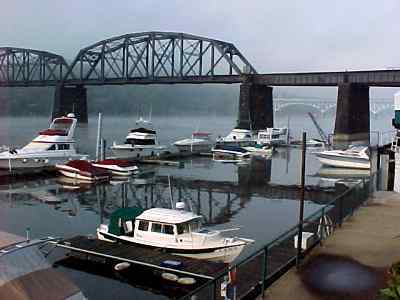 "Hey, Heartland Boating magazine, has an article on Aspinwall Marina, just above Pittsburgh, on the Allegheny River. It looks like the perfect starting spot." This magazine, and its joint publication, Quimby's Cruising Guide, is the bible for mid-continent cruisers.